The fretless version of the EBR3-N4 with inlayed fret markers for more accurate pitch control. All of the same tone and features of the fretted version but with a smooth playing rosewood fretless fingerboard. Offering a combination of traditional materials and high-tech design, this fretless 4-string acoustic-electric bass guitar from Boulder Creek (model EBR3-N4F) enables you to hear your playing without plugging it in. The side port on the top projects the deep tones from the body directly to the player while the additional front port shoots the low frequencies towards the audience. When plugged in, it keeps the same natural tone with much less feedback than other acoustic electric basses. All Boulder Creek guitars feature solid tops, solid backs, and laminated sides for strength and durability. The EBR3-N4F uses Boulder Creek's Solitaire body, which employs the Suspended Bracing System (SBS). A departure from the traditional X-brace, the SBS employs a pair of parallel aluminum braces that are anchored at three points under the top, but are otherwise suspended like a pair of towel racks. This allows the top to vibrate more freely, improving projection. 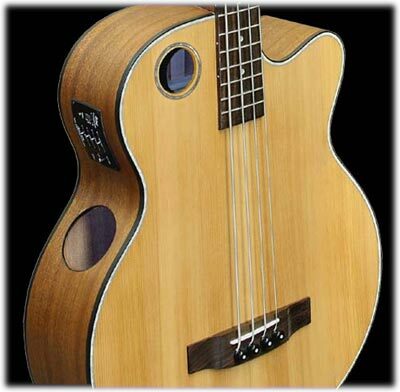 The area of the top is also greater, with a soundhole the size of half-dollar and a large oval port on the side, dramatically improving bass response. 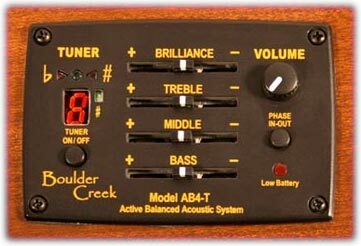 It's also equipped with the AB4-T Active Balanced Acoustic System with on-board tuner. The specially designed cable-type saddle transducer reduces the "clunk" that is inherent in traditional piezo pickup systems. The AB4-T System also feature both balanced and unbalanced outputs for maximum signal and noise reduction in both stage and studio applications.